It is often claimed that Bayesian methods, in particular Bayes factor methods for hypothesis testing, can deal with optional stopping. We first give an overview, using only most elementary probability theory, of three different mathematical meanings that various authors give to this claim: stopping rule independence, posterior calibration and (semi-) frequentist robustness to optional stopping. We then prove theorems to the effect that - while their practical implications are sometimes debatable - these claims do indeed hold in a general measure-theoretic setting. The novelty here is that we allow for nonintegrable measures based on improper priors, which leads to particularly strong results for the practically important case of models satisfying a group invariance (such as location or scale). When equipped with the right Haar prior, calibration and semi-frequentist robustness to optional stopping hold uniformly irrespective of the value of the underlying nuisance parameter, as long as the stopping rule satisfies a certain intuitive property. Hendriksen, A, de Heide, R, & Grünwald, P.D. (2018). 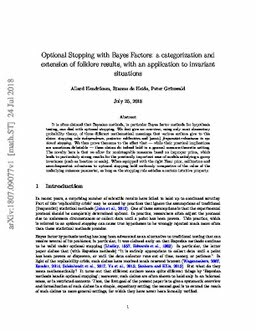 Optional Stopping with Bayes Factors: A categorization and extension of folklore results, with an application to invariant situations.